Representative Jamie Raskin Meets with IAVA Leaders in Washington D.C.
Washington, DC (June 9, 2018) – This week, Iraq and Afghanistan Veterans of America (IAVA), the leading voice of the Post-9/11 generation of veterans, testified on legislation to initiate support for injuries from burn pits and other toxic exposures, and continued to advocate for its Big 6 priorities during its quarterly Storm the Hill. 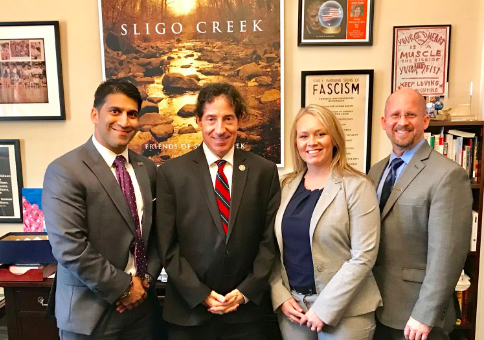 Earlier this week, IAVA members and leadership met with Representative Jamie Raskin (D-MD), to discuss the growing movement. Following the meeting, Representative Raskin cosponsored the IAVA-back Burn Pits Accountability Act and Deborah Sampson Act. IAVA members attending the meeting reflect a wide range of diversity and come from across the country. Attendees included Jeff Sigler, Corey Foster, and Shahriar Chowdhury. Storm the Hill: IAVA’s Storm the Hill (STH) is a quarterly advocacy campaign and the most powerful non-partisan policy impact program for post-9/11 vets in America. Veterans are selected from all across America in an extremely competitive process. They are diverse in terms of military rank, geography, gender, political party and ethnic background. These dedicated leaders volunteer to leave behind their families, jobs and school, to undertake an intense, once-in-a-lifetime training experience in Washington, DC focused on helping them become powerhouse veteran advocates for the rest of their life. These inspiring leaders are then unleashed on Washington in small teams for a barnstorming week of IAVA-led Congressional testimony, press conferences, panel discussions, meetings with Senators and Representatives, visits to VA, the Pentagon and the White House. Each year, Storm the Hill also introduces IAVA’s annual Policy Agenda and priority legislation. In 2018, IAVA’s focus is on 6 priorities that our members see as most pressing. This “Big 6” contains the challenges and opportunities that IAVA members care about most–and see as areas where we can uniquely make an impact. IAVA is building on our core four policy priorities from 2017 to elevate and introduce to the nation two long-standing issues that are extremely important to our community. IAVA members are poised to educate the public, design solutions for positive impact, and lead the way to the future. That starts with our 2018 Big 6. Each campaign will drive toward outcomes in 4 key areas: 1) Public Awareness 2) Executive Action 3) Legislative Change 4) Local Support. 2018 is the year IAVA will educate Americans about burn pits and airborne toxic exposures and the devastating potential impact they could be having on the health and welfare of millions of Post-9/11 veterans and their families. Year after year, we have seen an upward trend in the number of members reporting symptoms associated with burn pit exposure. IAVA will sound the alarm for all Americans: burn pits could be the Agent Orange for our generation of veterans. More details, bios of the Stormers, and a schedule of events can be found at StormtheHill.org.